William Sayer Snook was a pioneer businessman, who also represented the First Ward on the Oakland City Council and was an inaugural member of the Board of Education. He was born in New York City to a father who was a contractor and builder. He arrived in San Franciso on July 1, 1849 aboard the Tahmaroo with his brother George. The two promptly pitched a tent at Kearney & Washington and, instead of heading to the gold country, they went to work. They both eventually went in to the plumbing and gas fitting business. He also became an active member of the Vigilance Committee that maintained law and order in a city riddled with rampant crime and corruption. In 1854, he married the former Helen Laughan and they had 11 children together. Two of his sons followed him into the plumbing trade. His son Charles founded the law firm Snook & Church in Oakland and served as District Attorney from 1892-1894. In 1855, he moved to Oakland, where he was appointed to the newly created Board of Education. He was subsequently elected to the office, which began his political career as a Republican office holder. He was instrumental in building the first school house just west of Market Street. In 1869, he was elected to represent the First Ward on the Oakland City Council, where he served until 1875. He served on the Council with a number of prominent men buried at Mountain View Cemetery, including Nathaniel Spaulding, Enoch Pardee, Benjamin Ferris, Mack Webber and James Larue. His brother George Snook committed suicide in 1901 by filling his pockets with rocks and jumping into the bay. William Snook died of pneumonia at his Berkeley home at age 85. Officers David Branhan and David Marks were shot and killed with Officer Marks' service weapon after a suspect gained control of it. The officers had been dispatched to Madison Middle School on a call that a disorderly person was on the school grounds and fighting with school staff. When the officers arrived they located the man and took him to a conference room. The man began to struggle with the two officers and gained control of Officer Marks' service weapon and shot them both. The man was apprehended at a nearby apartment building after he was shot and wounded by other officers. About 1,400 law enforcement officials from throughout California attended the joint funeral services. 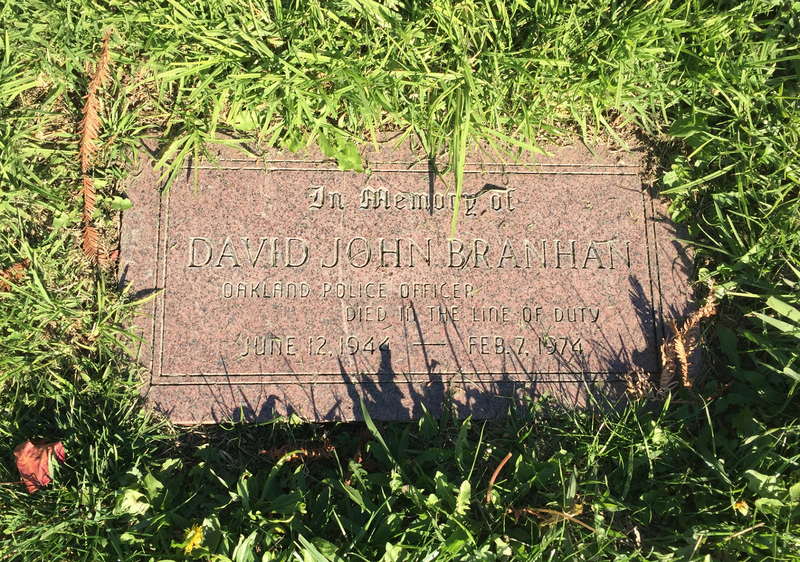 Officer David Marks is also buried at Mountain View Cemetery. 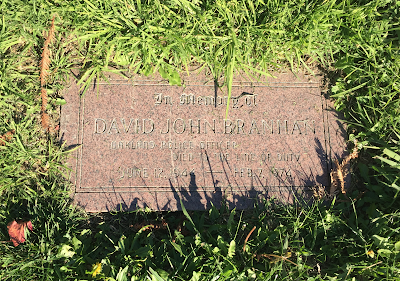 25-year-old John Richard was convicted of two counts of second degree murder and sentenced to two consecutive 15 year to life terms on May 29, 1975. 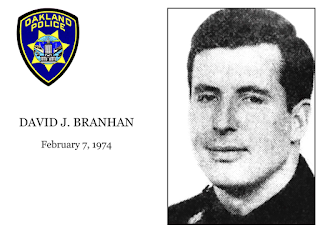 Officer Branhan had been a member of the Oakland Police Department for four years, and was survived by his wife Sandra, who died in 2008.